I thought I would post a few unique upcoming wine events you might be interested in. First and foremost, if you haven’t already take a moment and subscribe to The Juice a weekly newsletter of wine events in your area. A great resource. I’ve been to Prince Edward County a couple of time, actually due for a trip back! Once a year there is a gathering of County wines held here in downtown Toronto called County in the City that is a unique chance to try a lot of Prince Edward County wines in a single evening. My regular readers know that I’ve recently been exploring, and been suitably impressed by, a number of Greek wines. 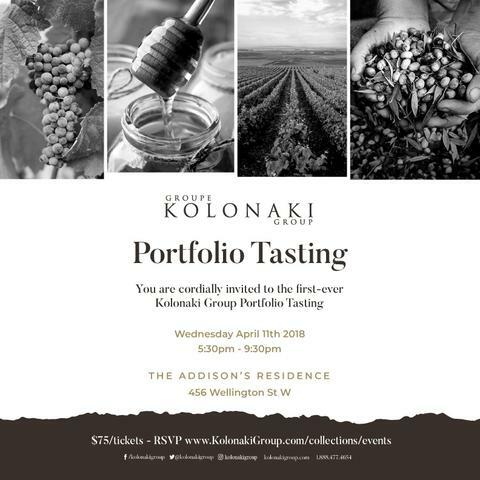 A new event has just been released that is a portfolio tasting of Kolonaki Group’s offerings. This is another unique opportunity to try a number of Greek products in one evening! Register now! This entry was posted in JG Review, Wine, Wine Events, Wine Stuff. Bookmark the permalink.